This recipe is amazing. I had never made a cheese cake before let alone attempted a goat cheese and gluten-free one and to be honest I was pretty nervous as botching it would mean wasting A LOT of pricey ingredients, not to mention I made it for my first try the night before a dinner party but since I am here posting it obviously it was a success! I have had no issue in the past making traditional dairy recipes with coconut milk so I was confidently hopeful it would work here too and it did. I made this one another time with goat yogurt and milk and it turned out great too! If using coconut milk I suggest full fat thick coconut milk and even draining off the separated liquid, you can find thickened coconut cream at some health food store which would work beautifully but it’s not necessary. The only other detail worth mentioning is whether you decide to use a “water bath” or not. I’ve now made this recipe both ways, the water bath method worked and the cake was very moist but the bake time was unbelievably lengthy, I honestly lost track but it was well over an hour and a half in my oven. The cake turned out without a water bath too but it did crack. Maybe do some further research yourself and decide which way you want to go. For the crust I bought one box of gluten-free Graham Crackers and one box of Mary’s Gluten-Free Ginger Snaps from Whole foods and combined at about a 2/3rds Graham to 1/3 Ginger Snap but honestly you can’t go wrong anyway here, use both or one or the other, doesn’t really matter. My guests consisted of a man I planned to impress, a very dear friend and fellow health foodie, her partner, a cheese loving, health foodie skeptic and their young daughter who said “seriously I don’t even usually like cheese cake but this one, with the pumpkin I love!”. All thoroughly enjoyed this cake and they even took the left overs home with them. I served it with a dollop of a vegan whipped topping mixed with cinnamon. Seriously Delicious. Oven 325 degrees. Wrap a 9-inch springform pan twice with aluminum foil (preferably heavy-duty). Take care to pull the foil all the way up the sides so that water cannot seep in from the water bath. Grease the bottom and sides of the pan with coconut oil. Pulse the crackers (or crumbs) and sugar in a food processor fitted with the metal blade until finely ground. Add the melted butter and pulse a few times to combine. Dump the moistened crumbs into the prepared pan and, using a measuring cup or glass, press into an even layer. Bake until fragrant and set, about 15 minutes. Cool on a wire rack while you prepare the filling. Bring about 2 litres of water to a simmer in a kettle (this will be used for the water bath). In a small, heavy saucepan, stir together the pumpkin, sugar, spices and salt. Over medium heat, bring the mixture to a sputter, stirring constantly. Reduce the heat to medium-low and cook, stirring constantly, for 5 minutes, until thick, bronzed and shiny. Scrape the mixture into a large food processor fitted with the metal blade and process for 1 minute. With the motor running, add the cold coconut cream then the goat cheese (cut into chunks) and process for about 30 seconds, scraping the sides if necessary, or until smoothly incorporated. Add the eggs and process for about 5 seconds or just until incorporated (do not over mix!). Set the cake pan in a large roasting pan. Pour the batter into the cooled crust, and then pour enough boiling water into the large roasting pan to come about halfway up side of the cake pan. Bake until the cake is just set, about 1-1 1/2 hours. If it jiggles, it’s not done. Carefully remove the roasting pan from the oven and set on a wire rack. Use a paring knife to loosen the cake from the sides of the pan. Cool until the water is just warm, about 45 minutes. Remove the springform pan from the water bath, discard the foil and set on a wire rack. Continue to cool at room temperature until barely warm, about 3-4 hours. Cover with plastic wrap and refrigerate until chilled, at least 4 hours or overnight. 1) A springform pan (with removable side and bottom) is the most commonly used pan for making cheesecakes. 2) Avoid over-beating the batter. Over-beating incorporates additional air and tends to cause cracking on the surface of the cheesecake. 3) For even marbling and the best distribution of added ingredients, such as chocolate chips or nuts, do not over-soften or over-beat the cream cheese. 4) Avoid over-baking: Cheesecake baking times are not always exact, due to variations in ovens. The cheesecake will continue to bake after it is removed from the oven. The center of the cheesecake should be just slightly moist when it is ready to be removed. 5) Upon removal from the oven, loosen the cake from the edge of the pan by running the tip of a knife or narrow spatula between the top edge of the cake and the side of the pan. This allows the cake to pull away freely from the pan as it cools. 6) Cool the cheesecake on a wire rack away from drafts. 7) After a cheesecake has cooled completely, gently loosen the entire side of the cheesecake from the pan with the tip of a knife while slowly releasing the springform pan clamp. Carefully remove the side of the pan. 8) Baked cheesecakes freeze well. Cool them completely and wrap them securely in heavy-duty foil or plastic wrap, but do not freeze cheesecakes with garnishes or toppings. 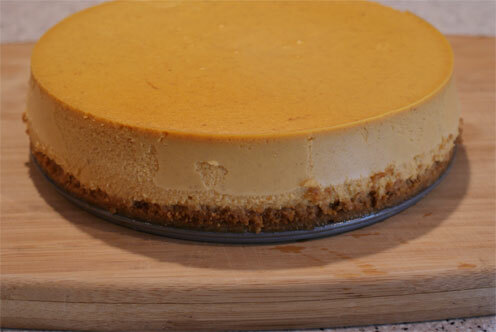 The most common complaint is cracking that develops through the middle of the cheesecake during or after baking. Bake the cheesecake in a water bath (instructions below) to keep the oven moisture high and the heat gentle. Don’t overbake the cheesecake. When perfectly done, there will still be a two to three-inch wobbly spot in the middle of the cheesecake; the texture will smooth out as it cools. Cheesecake will shrink as it cools. Generously greasing the sides of the baking pan before pouring in batter will allow the cake to pull away from the pan as it cools and shrinks instead of pulling apart from the middle. Cheesecakes have a tendency to crack, but they don’t have to. This favorite American dessert can have a cracked surface for a number of reasons. One cause is air trapped inside the batter – a result of over-mixing. Once in the oven, the air bubble expands and wants to escape from the cake. As it finds its way out of the top of the cake, it creates a crack or crevice in the cake’s surface. Another cause of a cracked surface is a drastic temperature change. How to avoid cracks then? Be sure to mix your cheesecake batter well, eliminating all possible lumps in the cream cheese BEFORE you add the eggs. It is the eggs that will hold air in the batter, so add them last, and mix as little as possible once they are in the mix. Also, be sure to cook your cheesecake gently. Use a water bath – wrap the bottom of your springform pan in aluminum foil and place it in a larger pan with water in it, just halfway up the outside of the springform pan. This will allow the cheesecake to cook more slowly and evenly. Finally, cook your cheesecake slowly – at 325º F. After about 45 minutes, turn your oven off and leave the cheesecake inside the turned off oven for another hour. Cool at room temperature with a plate or cookie sheet inverted over the cheesecake to slow the cooling. Only then can you refrigerate the cake, which you will need to do for another 6 hours at least. If after all this, you still have a crack, make a topping or a sauce for your cheesecake, and tell all your guests that you intentionally made a special crack in the top of the cake to hold more sauce! A “water bath” is a method that will help keep your cheesecake from cracking while baking. First, take heavy aluminum foil, and wrap it around sides and bottom of your springform pan or cheesecake pan with removable bottom. This prevents leakage while baking your cheesecake. Place your springform pan or cheesecake pan (filled with cheesecake batter and crust) into a larger deep baking pan* that it will fit into easily. *Note: The larger pan should be at least 2-3 inches in depth. Place in pre-heated oven. With a kettle filled with very hot water, pour water into the larger pan about halfway up, or approximately 1 1/2 to 2 inches. Bake cheesecake as directed. When cheesecake is done, remove springform pan or cheesecake pan (if using) from “water bath” in oven. Carefully remove larger pan with water in it from oven. It will be very hot. Discard water when it has cooled. 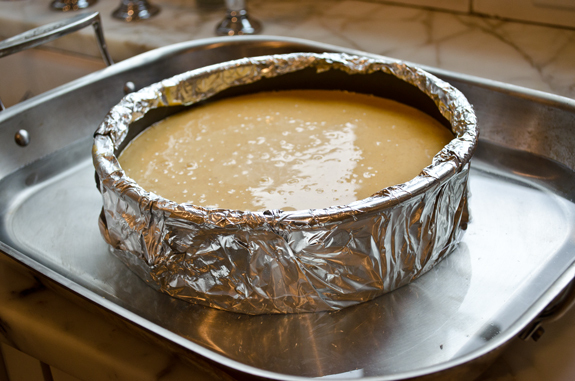 Remove aluminim foil from sides and bottom of pan after your cheescake has cooled completely in the refrigerator. When you are ready to release sides of springform pan, or remove cheesecake from a cheesecake pan with removable bottom (if using) and cheescake has cooled in refrigerator at least 4 hours or overnight; this is the best time to remove aluminum foil.